The New York Times–bestselling novel by the critically acclaimed author of Native Speaker and A Gesture Life. At 59, Jerry Battle is coasting through life. His favorite pastime is flying his small plane high above Long Island. 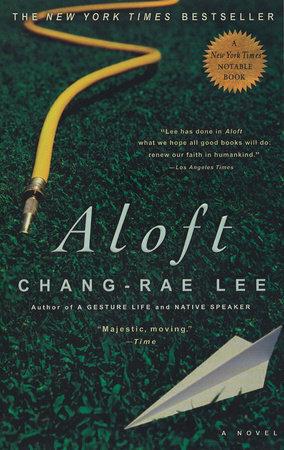 Aloft, he can escape from the troubles that plague his family, neighbors, and loved ones on the ground. But he can't stay in the air forever. Only months before his 60th birthday, a culmination of family crises finally pull Jerry down from his emotionally distant course. Jerry learns that his family's stability is in jeopardy. His father, Hank, is growing increasingly unhappy in his assisted living facility. His son, Jack, has taken over the family landscaping business but is running it into bankruptcy. His daughter, Theresa, has become pregnant and has been diagnosed with cancer. His longtime girlfriend, Rita, who helped raise his children, has now moved in with another man. And Jerry still has unanswered questions that he must face regarding the circumstances surrounding the death of his late wife. Since the day his wife died, Jerry has turned avoiding conflict into an art form-the perfect expression being his solitary flights from which he can look down on a world that appears serene and unscathed. From his comfortable distance, he can't see the messy details, let alone begin to confront them. But Jerry is learning that in avoiding conflict, he is also avoiding contact with the people he loves most.